Holes is one of the few books I can read over and over again when I need a little pick-me-up. Now, I’m getting fashion inspiration from this fun read. Fashion inspiration can be found anywhere, and books are incredible sources for style innovation. Book Inspired Fashion explores these treasure troves, and brings them them to you in looks inspired by vibrant characters, far away lands, brilliantly woven plotlines, and more. I’ve been excited about this article ever since I decided to write about it a few weeks ago! I first read Holes when I was in elementary school, and it’s remained one of my favorites. This is probably written for older kids/young adults, but I loved it then and I love it just as much now. This is the book I throw at everyone when someone wants a fun-to-read but moving book for kids/teens. What I love most about this book is the world it is set in – it feels so real, and somehow, it’s so easy to relate to all the characters – even when your situation isn’t like theirs at all. Louis Sachar has an amazing ability to create characters that feel like people you’ve known your whole life. And for someone like me, I’ve had the pleasure of knowing these characters for a huge part of my life. Holes is one of the very few books that I can read over and over again when I need a little pick-me-up. 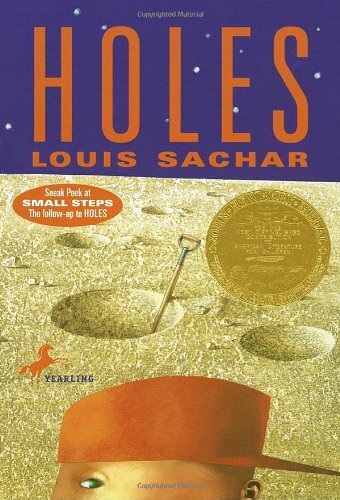 Holes, as mentioned above, was written by prolific author Louis Sachar, whose books have been read by millions of people around the world. Holes was published in 1997, and went on to win the National Book Award in Young People’s Literature in 1998 and the Newbery Medal in 1999. The protagonist of the novel is Stanley Yelnats IV (his name is a palindrome! ), whose family line has supposedly been cursed with bad luck. They have a tendency to be in the wrong place at the wrong time, and Stanley is sent off to Camp Green Lake (which no longer has said lake) to dig holes as punishment for stealing shoes – which he didn’t actually steal. At camp, he meets a cast of interesting boys, most notably Zero, who is the best at digging holes. He also meets the Warden, who turns out to have ulterior motives for having all the boys dig holes. The novel jumps from the present day to the past, when Kate Barlow and Madame Zeroni lived, and you’ll be stunned by the depth and complexity this seemingly simple novel has once you’ve put all the pieces together. And if you’re anything like me, you’ll be dazzled by how original but heart-wrenching this story really is. It was adapted into a movie in 2003 starring Shia LaBeouf, who I’ve been told was able to convincingly breathe life into Stanley’s character despite not having the large, overweight presence that Stanley had in the book. Now enough with the technical stuff – here we go! He cries to the moo-oo-oon,“If only, if only” (Sachar 8). As you read along, you’ll find a lot of things that inextricably tie the character together. This song is one of them, and it ends up being crucial to Stanley and Zero’s relationship. This song represents comfort and home in a way that very few things do at Camp Green Lake, so I was inspired by softness and even a bit of nature in the color palette. Unlike the next two looks, this outfit is much more feminine with the floral print and light fabric of the dress. The western style boots are a subtle indicator of the desert environment, and I finished off the outfit with a delicate sterling silver necklace of a little bird to represent the woodpecker in the song. The shovel felt heavy in Stanley’s soft, fleshy hands. He tried to jam it into the earth, but the blade banged against the ground and bounced off without making a dent. The vibrations ran up the shaft of the shovel and into Stanley’s wrists, making his bones rattle (Sachar 26). No matter how you look at it, Stanley was forced to do excruciating manual labor every day by digging a hole 5 feet deep and 5 feet wide in hard, packed dirt. This is the most attention-grabbing aspect of the overall premise of the novel, and the holes really symbolize probably the most pivotal time period of Stanley and Zero’s lives. As a kid, I couldn’t imagine digging holes from dawn till dusk as a punishment, and I still can’t now that I’m in college. Louis Sachar does a stunning job of combining a very real, tangible punishment with the easiness of his writing style to create an atmosphere that seems incredibly realistic. 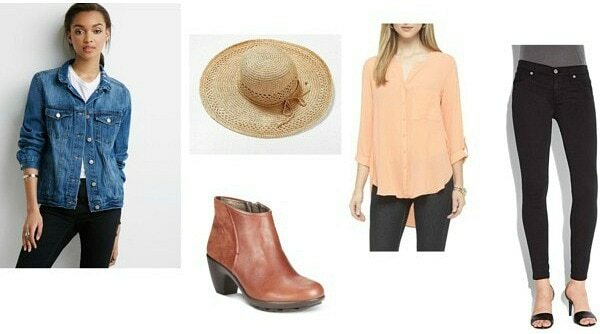 This look is based on the desert setting of present day Green Lake (mentioned in the look above), and the orange jacket is a tribute to the horrid orange jumpsuits the boys had to wear in the sweltering heat. This jacket is definitely one of the most, if not the most, expensive piece I’ve ever used in a set, but I absolutely love it and had to use it in my jumpsuit-inspired look. 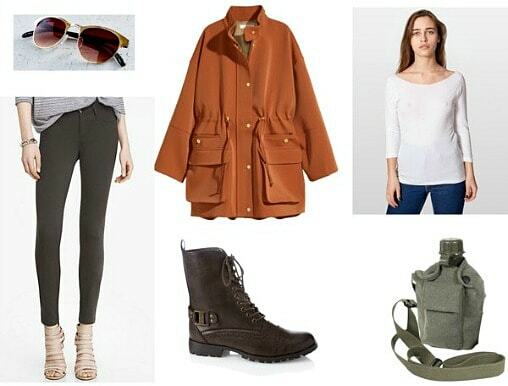 The rest of the outfit is very simple and comfort-oriented. It felt like heaven as it flowed over his dirty mouth and down his parched throat. He thought it might have been some kind of fruit at some time, perhaps peaches. Zero smiled at him. “I told you it was good.” (Sachar 157). “Sploosh” is the name coined by Zero to refer to the sweet drink that saves his life after he and Stanley escape from the camp. What they don’t know is that it’s the remnants of the peach preserves that Katherine Barlow packed many years earlier, before she became Kissin’ Kate Barlow. Kate Barlow is one of my favorite characters of any of the books I’ve read, and I wanted to create a final look that connects her with Stanley and Zero across different time periods, when Green Lake actually had a vibrant lake and a thriving town. With this final outfit, I wanted to focus on function over form, and practicality over stylishness. Of course, the peach-colored top is a reference to what Sploosh really is, and I chose a blouse that’s pretty, but still appropriate for work. The pants are a dark wash pair of jeggings, which I love because they really do look just like jeans, but with added comfort. They’re versatile and wouldn’t take up too much space if you’re moving around – or hiking up a mountain, if you’re Zero and Stanley. Overall, the look is simple and classic, without being too boring. The denim on denim is a bit of homage to Texas, actually, since the story takes place primarily in that state. Also, if anyone can pull off a denim jacket over jeans, it’s going to be a Texan. I did my best to not give any major spoilers, because I’m hoping that, if you haven’t already read it, you guys will pick up this book and give it a try. No, it’s not the complex 1000+ page monster that Les Misérables is (another of my favorite books of all time!) but it has such an incredible amount of heart and spirit, and it really is an unforgettable story. There are a lot of amazing books that we read at all ages, like Charlotte’s Web as children and The Outsiders as pre-teens, but Holes transcends age groups in the same way that Harry Potter does, and I think it should be on everyone’s reading list at some point or another. I’m not trying to say that this book is perfect, but in my admittedly biased opinion, it doesn’t get much better than Holes in terms of memorable characters, entertainment value, a compelling plotline, and a long-lasting impression. Next week, I want to cover a book that is another one of my childhood favorites, so it’s not a complete 180 this time. This book was published around the same time as Holes, and I love it just as much. Have you ever read Holes, or watched the movie? What do you think of these looks inspired by such a beloved childhood favorite? Let us know in the comments below!